And some that you lose sting a little more than others. Gotta admit that this one stung for a while. Makes it even worse that it was caught on video so I can relive it over and over again if I so choose. I have so chosen and you know, it’s really kind of a cool strike, especially in slow motion. 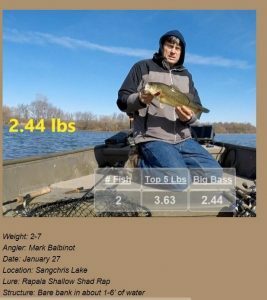 It gives me some extra time to analyze the incident and assess what I could have done differently to land this boatside blast from a bass in the 4 to 5 pound range. I actually got a great split second view of the fish in the last couple feet of the retrieve as it chased down and struck the bait. Kind of weird there too as that brief instant also seemed to have a slow motion feel to it. However, it did not last long before reality shifted back to full speed and the fish and my buzzbait were gone. 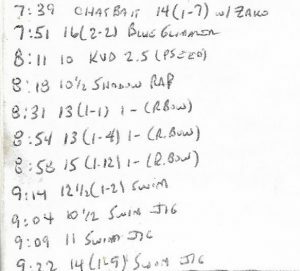 In regards to what I could have done to land the fish, I guess one potential item would involve having my drag set a little looser thus potentially allowing the fish to run. Tough call on this one as my drag was pretty well dialed in for a typical strike whereas a strike with only a couple feet of line out is a whole different ballgame. A second possibility would have been to disengage my reel and thumb it in free spool as the fish charged off with the bait. I’ve actually done this with success on a couple boatside muskie strikes but must admit that those were nowhere near as vicious and sudden as this bass strike thus providing an extra fraction of a second for those motor skills to instinctively kick in. A final possible route to success would be to switch my allegiance from monofilament line to some sort of braid or super line. Not gonna happen in the near future, if ever, as I’ve been there and they just didn’t suit me. Besides, my good, old Trilene 12-pound test has come out on top versus muskies pushing 20-pounds, walleye over 10 pounds and just a few big bass. Plain and simple, I’ll put my money on my experience and low budget gear over pricey superlines any day of the week. In the end, this one just wasn’t meant to be and while I was disappointed at the time, I eventually got over it. I can watch this video and simply appreciate the power of the freight train like strike of this fish and admit that it got the best of me on this day. 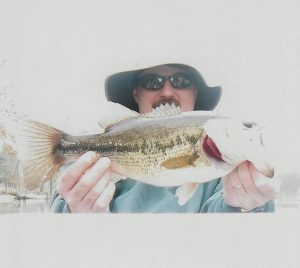 My main concern in looking back on the bad break is that the bass was able to dislodge the lure, go about its business and live to make another mistake. Hopefully, just a little farther away from the boat. 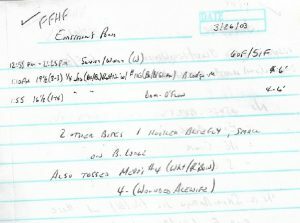 Week 3 of the Friday Flashback series breaks away from Emstrom’s Pond as featured the first two postings. After losing our access to the old favorite pond in 2004, I needed to find another locale to start my fishing year. Didn’t take much thought as the focus shifted to the Knox County strip mines, both public and private. 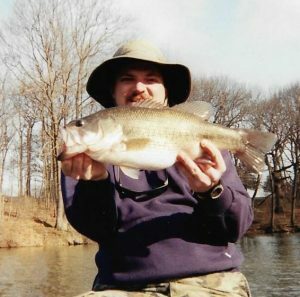 For quite a few years now, my goal has been to post my first bass in March and going back to 2002 I’ve managed to do just that every year to present. May not sound like much of a feat but weather, responsibilities and a bunch of kids can make it a challenge. And while it would be nice to slow time down a bit in regards to that last item, we have reached the point where one of the boys is ready to tag along for a March outing (a report for another day on how we did today). 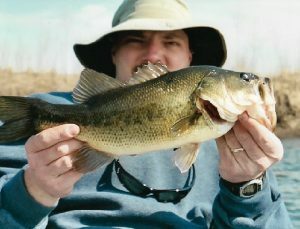 The bass featured today came from a 2008 trip to Little John Conservation Club as I achieved that whole March bass goal by about the narrowest of margins. This was my first bass of the year on the next to last day of the month and was the only one I could muster in three hours of casting. Now this picture leaves much to be desired similar to more than a few others in the photo album. I’m not sure why I did not get a better shot though as I had entered the world of do over, digital photography at this point but apparently did not check the pic before releasing my catch. It is apparent that this shot comes from the days before I began packing along a tripod to assist with the pre-selfie selfies. Instead, I used to prop my camera up on a stack of utility boxes to get the shot and that is likely what serves as the white border in this washed out photo. Still holding the fish in front of my face too, despite Julie’s advice on shooting better fishing pics. And speaking of photographs, I believe that I have at least a moderate form of what I like to call a piscatorial photographic memory. For while this is a decent bass at 18.5” and weighed in at 2-13, it certainly does not qualify as one of those “trophy” moments on the water. Yet, I can still tell you exactly where I caught this fish, even though I won’t. I will tell you what I caught it on and that was a white Chatterbait. It just so happens to be my current Chatterbait Top Bass which likely pales in comparison to the top Chatterbait bass of many anglers. I have seen catches and heard tales that easily outclass this fish but it’s just never been my forte or go to bait. 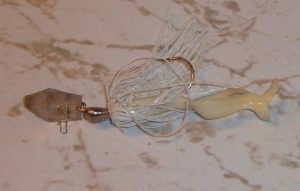 Perhaps someday I’ll leave my favorites at home and give myself some much needed practice with this lure. You ever see one of those fancy bass tourneys where the anglers dig around in the livewell to fill their bag for the weigh-in and triumphantly thrust their largest catch into the air triggering the adulation of thousands of fans? Well, this wasn’t quite like that. 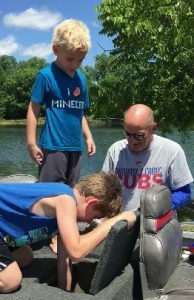 For one thing, we were bluegill fishing. For another thing, we had just pulled the boat out of the lake via a gravel and grass boat ramp. And, oh yeah, there wasn’t another soul in sight for our fishing trip finale and video shoot. Nope, this was a pretty low key affair but with a couple high energy young anglers in tow and some high strung bluegill in the livewell it got rather exciting. You see, fishing some feisty, slimy bluegills out of a partially drained livewell can present a challenge as they don’t quite have the handy handle like a largemouth bass lip. Even with little hands it still not a lot to grasp. Well, when old “No Lip” was snatched from the livewell it appeared as if he was in the mood to get a little revenge. As Papa notes in the video, those bluegill have some pretty stiff fins that can inflict a bit of pain or even draw blood if they get you good while flopping around. And in Jayce’s case in this clip, there was more than the typical finger stick at stake. Let’s just say a bit more tender. “He was caught on a summer day, 2017…Oh, what a lonely bass, oh, what a lonely bass, oh, what a lonely bass.” – Andrew Gold (sort of), Lonely Boy (1977), click here for YouTube video of this 70’s classic after you read this blog entry. Hey, every once in a while inspiration hits me prompting the inclusion of some of my good, old song lyrics. Hadn’t went there for a while and woke up the other day with this song and Video #4 on a loop in my head. Guess this blogging thing gets a little obsessive at times but sure beats waking up thinking about how to resolve some sort of technology issue. Get to do that all week so nice to find that the imagination can still intervene on the weekend. This catch came on 7/25/17 at 8:31pm from Iowa’s Lost Grove Lake and was the only fish I caught the entire evening in just over two hours of fishing. A 10” trophy for me in avoiding an embarrassing summertime shutout. I was so pleased to get on the board that I shot a picture, rowed to the ramp and called it a night. I figured that there was no better way to end a tough day than with being able to claim a last cast bass. And I should probably end this post right now as well. On the water you will inevitably have some “lonely days” (1) or a “lonely night” (2). But even if “it’s a lonely ol’ night” (3) “don’t you ever be ashamed” (4) if you can’t get the fish to cooperate. Instead, “if you just ask the lonely” (5) bass perhaps he can point you towards a few of his friends. Sometimes I wonder how many casts I’ve made over the years. Don’t really have the slightest clue. But what I do know is that the old “practice makes perfect” saying is not entirely accurate when it comes to this skill (or any other I suppose). For no matter how many casts you’ve made, there are still those that end up errant and off target. Such mistakes can range from a mere fraction of an inch to one of those weird ones that crops up on occasion and leaves you wondering just how a seasoned angler could foul it up that bad. Gotta be wind or equipment failure, right? But as today’s video shows, even when you miss your mark, good things can still happen. As finicky as we might find those bass to be on some days, they are still top of the line predators that are built and programmed to eat. If your lure is in the water, it’s fair game. Such was the case with this catch from Iowa’s Lost Grove Lake, a fishing hole that can be quite frustrating due to an abundance of slimy, scattered vegetation. While the cast doesn’t look as ugly as a toss into a tree or onto a boat dock (done ‘em both more than a few times) it nevertheless struck me as a wasted shot into some of the nasty subsurface weeds. Fortunately, the lure came through unscathed by the vegetation which just so happened to be the hiding place of an interested bass and that aspect was indeed part of the plan. A plan that worked to perfection despite an imperfect cast. Without the audio on this clip one would never even know that I was essentially looking ahead to my next cast as this one didn’t stand a chance. 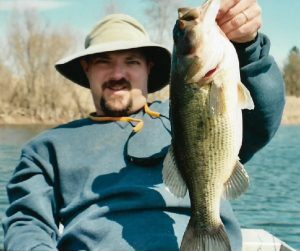 Boy, I miss the days of a having permission to fish a pond that took about three minutes to drive to from my folks house where we kept our little johnboat. But while some things have changed, several items in this photo have not. But first, the stats on the day. Still fishing out of that same old boat. Still got that sweatshirt, think I’m wearing it today, in fact. Still got the ring, of course. Still sporting a floppy hat, got this one in the garage as I’m now on FloppyV.2.0. Still sporting a beard/goatee although something looks a little different these days. Can’t quite put my finger on it. Shaggier, perhaps? Still shooting selfies these days, albeit with that “phone” as well as a camera. Today’s clip features a catch from October 8 on a public Knox County, IL strip mine pothole. It was one of sixteen bass landed in just over four hours on the water with the first eleven coming from this spot during my first two hours of casting. If you do the math on this first stop that equates to 5.5 bass per hour which is really pretty darn good. Now here’s the weird thing about this borderline feeding frenzy. Those eleven bass came on six different lures. 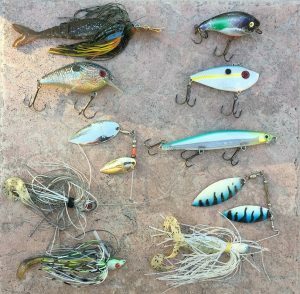 It was truly a bizarre sort of buffet as the bass never really showed a preference for a particular presentation yet still proved to be cooperative if I was willing to keep my lure choices rather dynamic. What was also puzzling was that I was all in at the start to nab some on an old topwater favorite, the Zara Spook, and never got the slightest hint of interest. And after five minutes of that I put it down in favor of a chatterbait. Four casts later I had the fish in this clip after a pair of short strikes on two of the previous casts. Sure seemed like they were taking a liking to the chatterbait. Nope, couldn’t coax another bite the rest of the time on this spot. 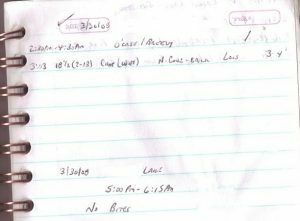 However, I did continue to catch bass as evidenced by the snip from the log entry below. 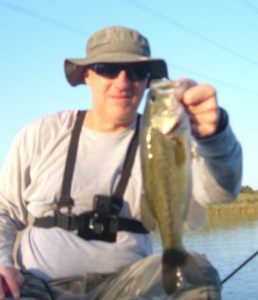 Briefly got them dialed in on a Mann’s Baby 1- crankbait and a Swim Jig but those flurries were fleeting as well. In the end I was quite pleased with the overall results on this relatively unfamiliar pothole as it was indeed a productive stop. I also gave myself a pat on the back for being diverse in my offerings and changing up when my “can’t miss” baits (Red Eye Shad lipless crank and Senko wacky rig) only got the interest of one bass.